Art lighting Ho Chi Minh Mausoleum: Ho Chi Minh Mausoleum is a construction of gathering all your heart the people of Vietnam and international friends, not only meant purely mobile store remains of the famous leader but also an architectural beauty and historical value beyond the world. 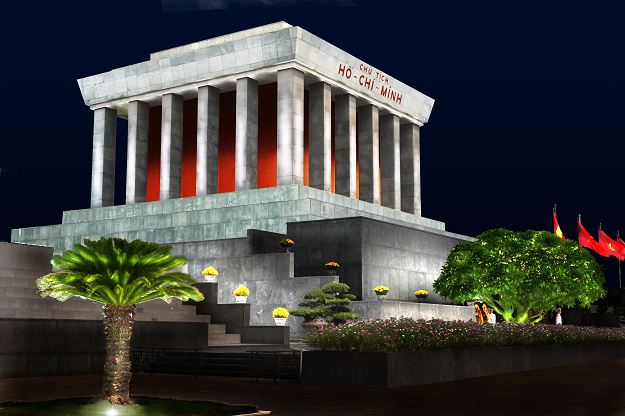 A place for the people of Vietnam and international tourists to visit President Ho Chi Minh. About Mausoleum Uncle, for every citizen of Vietnam is an emotional need, a customary, traditional living a grateful source said, towards the root before each step up. From the elderly to the children; from ordinary citizens to officials and state employees, but each has a different working position but when in the Physicians have found serenity, tranquility. Many foreigners visiting Vietnam, standing in front of his tomb was feeling: Few world leaders are admired by people like President Ho Chi Minh. Ba Dinh Square where President Ho Chi Minh read the Declaration of Independence, the country that gave birth to the Democratic Republic of Vietnam, now the Socialist Republic of Vietnam. It is a sacred history to the people reminisce about the epic struggle, patriotism, ethnic pride, independence will arouse self-improvement, determined to protect and develop the country and is host to major events in the country. With moral tradition: "drinking water, remember its source", "Gratitude", forever remembering the great heroes of the martyrs, the Central Committee and the government has a plan to build: radio commemorates the heroic martyrs who sacrificed for the independence of the national freedom in Bac Son road, opposite the Ho Chi Minh Mausoleum, next to the Imperial Citadel of Thang Long and Ba Dinh Hall. This position is significant political, cultural and historical depth. It is one of the sacred solemnity of the nation. The vicinity of the tomb, such as gathering area, Garden Dominic, and the roads around the building Tomb: Hung Vuong Street, Independence Road, Bac Son street, welcoming hosts, visiting living political culture located in the historical - cultural Ba Dinh.